Group demonstrates at Afula Central Bus Station in response to murder of IDF soldier Eden Atias; MKs call for end to talks with PA.
Demonstrators converged on the Afula Central Bus Station Wednesday in an spontaneous outpouring of public anger to the horrific murder of IDF soldier Eden Atias, Hy"d, who was only 19. 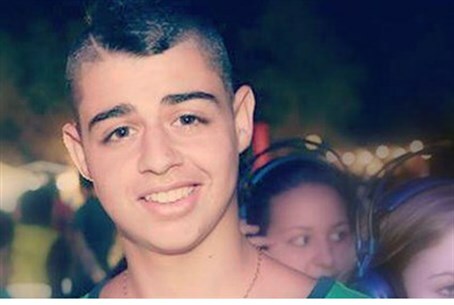 A Palestinian Arab teenager stabbed the soldier to death Wednesday morning as he slept on a public bus. The demonstrators, mostly young people, streamed through the station with pickets and chants, and garnered support among many passersby. Angry protesters shouted "Jewish blood is not cheap!" and "Death to Arabs!" A Facebook page honoring Atias's memory went up shortly after the announcement of his murder was made, and already has over 20,000 "likes." Friends of the IDF soldier have already added messages of support for his bereaved family and stories about his impact on their lives. Linda Mizan, an Ashdod resident, wrote that Atias's murder is not only tragic, but bone-chilling. "There is no pardon for acts of terror like this. Something drastic needs to be done. It is unimaginable that in our country, we remain unprotected, and live in fear of the next terror attack. This cannot be ignored." Both Mizan's response and the protesters' chants reflect public outrage at Israel's agreement to allow the release of convicted terrorist murderers into civilian areas as a precondition to negotiations with the Palestinian Authority. Many Israelis fear that releasing hardened terrorists with blood on their hands not only enables them to murder again, but encourages others to do the same, in the knowledge that even if they are caught they could be released. Police spokesman Micky Rosenfeld confirmed suspicions that the stabbing was nationalistically motivated. "We consider this incident to be a terrorist attack motivated by nationalism," Rosenfeld said to AFP. Meanwhile, Hamas spokesman Fawzi Barhum applauded the attack on his Facebook page, writing: "Congratulations to the Palestinian West Bank hero who killed an Israeli soldier in Afula this morning,"
"This is a heroic act of resistance showing that all methods of oppression and terror have not and will not succeed in stopping our people from carrying out jihad and resistance." Calls have already begun to permanently stop talks with the PA, and the accompanying prisoner releases. Deputy Defense Minister Danny Danon (Likud) called on Prime Minister Binyamin Netanyahu Wednesday to stop terrorist releases once and for all. “I can’t imagine that any sane country, including the United States of America, would free terrorists after attacks," Danon said. Likud MK Tzipi Hotolevy stated to Arutz Sheva that the terror attack "is another proof that the Palestinian Authority is not willing to negotiate with Israel", and that its only motivation is to gain "international legitimacy for terror attacks." Prime Minister Binyamin Netanyahu has not yet made a statement about the incident, nor about possible repercussions for ongoing negotiations. The incident also occurred just one day after a hearing was convened in the Knesset about the dangers of Palestinian Arabs illegally entering Israeli towns on the public transportation system. MKs present at the hearing heard how reports of attacks by Palestinian Arabs, including incidents of physical and sexual assault, have become commonplace in Judea and Samaria. While some MKs staunchly opposed segregating the bus system in response, Wednesday's attack - which was carried out by an assailant who illegally entered Israel from PA-held regions of Judea and Samaria - may sway the Committee to reconsider their legal options in regard to the ongoing problem.